Olympic bronze medalist Dave Roberts won three straight NCAA pole vault titles for Rice from 1971-73, was inducted into the USA Pole Vault Hall of Fame. 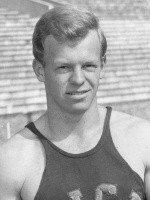 Roberts, who won bronze at the ’76 Games in Montreal, was the first man to win three straight NCAA titles outright in the vault. 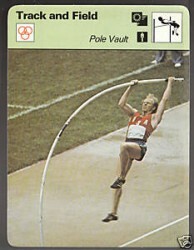 He cleared 17-6.5 in 1971, and followed with winning heights of 17-3 and 17-4. He still holds the Rice school record at 18-0.25. The Conroe High School product set his first world record on March 28, 1975 in Gainesville, Florida, soaring over 5.65m/18-6.5, and he added another world record on June 22, 1976 in Eugene, Oregon, when he cleared 5.70m/18-8.25. Roberts won U.S. national championships in 1972 and 1974, and was the Pan American Games silver medalist in 1971 at Cali, Colombia.